Lizzie is based on the true story of the notorious Lizzie Borden, who stood trial for the infamous murders in 1892 of her father and stepmother in Fall River, Massachusetts. Still unmarried at 32, Lizzie (Chloë Sevigny) is a bit of a social outcast. She still lives at home with her well-to-do but miserly father Andrew (Jamey Sheridan), who has remarried following the death of his first wife, to Abby (Fiona Shaw). Lizzie and her sister Emma live claustrophobic lives under their father’s cold and domineering control, but Emma seems to handle it with a calmer demeanor. 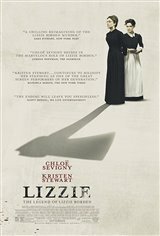 When Bridget Sullivan (Kristen Stewart), a pretty young Irish maid, comes to work for the family, Lizzie finds a sympathetic and kindred spirit in her and the two develop an intimate relationship. Together, a secret intimacy soon blossoms into a wicked plan.